I met visual artist Houl at Oh Really Gallery recently for Without Walls, an exhibition of paintings, art print t-shirts and hipsters colour coordinated within 'autumn register'. Houl (pronounced Hole) painted an interior wall during the show. A series of his small paintings hung a couple of metres away. It was obvious from these pieces his street and gallery art blur together to create a homogenisation of concept and form. He lives in Sydney's inner west and if you've passed through the Sydney hipster belt lately you've probably seen one of his posters hunching over a shop front. The subjects of this street art - deadbeats of wasted potential - contradict the raised chins and high heels that strut past them. 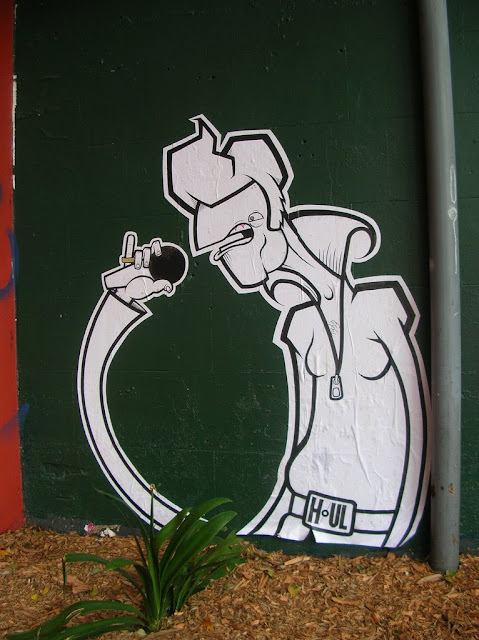 I caught up with Houl to find out more about his paste-ups, his ideas and what the Movement Collective is about. 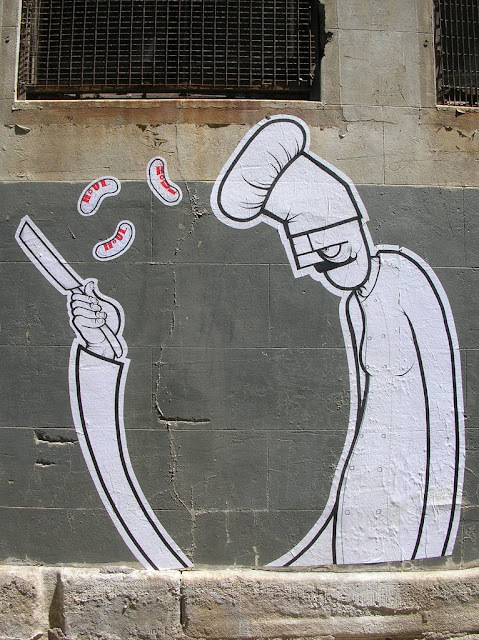 For me, street art began pretty much a case of monkey see monkey do. I saw something I liked and wanted to do the same. It took me a while to really get into, mainly because once I'd finally figured out exactly how to go about putting my own stuff up on the street, I then had to get the balls to go out and do it. Why do you call yourself Houl? I've got to keep some things secret, if I tell you this it'll ruin the mystery. Maybe it's an anagram, maybe it's purposeful misspelling, maybe it's the name of my sled from when I was a boy. What kind of visual/street art are you currently doing? I've just survived a bout of canvas painting for a number of upcoming shows and before that i was busy practicing for secret wars, so i haven't been doing too much street art lately. That said i've got a huge roll of paper sitting by my desk and another of sticker paper being used as a door stop, so pretty soon i'll be frothing at the mouth with paste-ups and stickers. Where can peeps find your work? 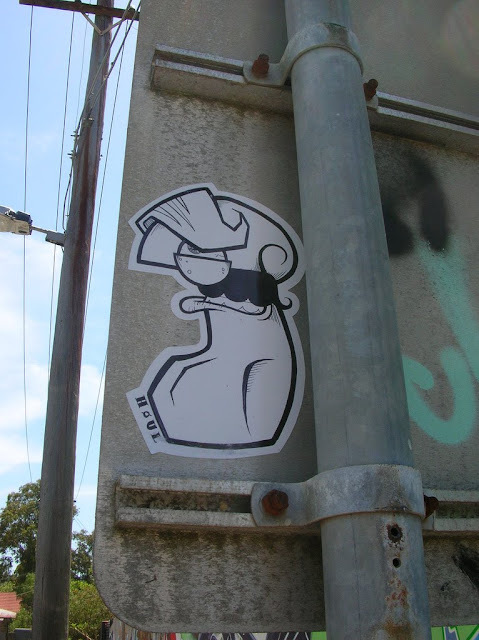 My paste-ups be found throughout Sydney, specifically the inner west, mainly in the standard street art friendly areas like Newtown and St Peters. You'll also find them in places like Ultimo, Petersham, Surry Hills and Marrickville. My stickers however have a greater range and a tendency to travel, with some migrating to Melbourne with me on a recent jaunt down there, and a batch even visiting Iceland and Canada with a friend. How do you choose subject matter? Where do the half-baked horror mutants come from? To be honest, the process of "choosing" my subject matter is as simple as me thinking "Yeah, I want to draw a wizard, they're pretty boss," then I draw a wizard. It's as easy as that. However, because self indulgence is fun, I like to think that instead of this shallow creative process, in more more recent sketches i've been doing i'm instead re-imagining unfulfilled childhood ambitions. I never knew what I wanted to be 'when I grew up' but the kids around me had some crazy notions, "I want to be a spaceman, I want to be a karate master, I want to be a rainbow and live in a tree." They had some pretty grand plans, and now they're all deadbeats, living at home, wasting their days sucking on the parental teat, while spending their nights hooning the streets of the small town I grew up in, doing nothing with themselves. My "half-baked horror mutants" are tributes to their wasted potential, or at least I like to pretend this is the case, really I just like drawing wizards. 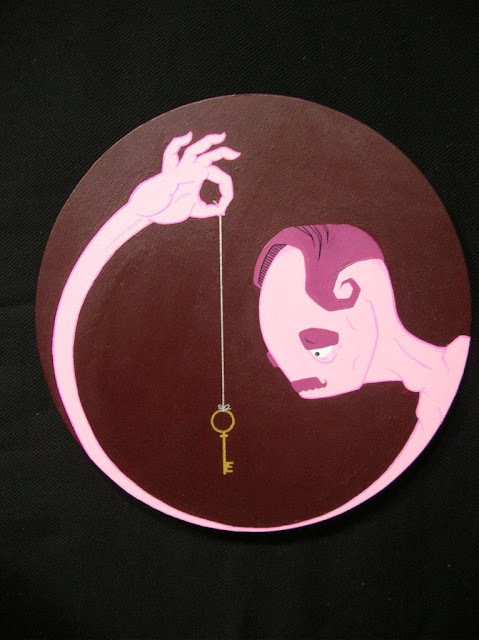 What commercial art have you done? I haven't done too much commercial work, but I did have the opportunity to paint some panels for the launch party of Belvedere IX Vodka at The Ivy. The vodka bottle had been branded by a big name French street artist, so they wanted something "street" and I was roped in along with some other members of The Movement. That was about as commercial as I've gone, but i've also painted at Oxford Art Factory for a magazine launch, a mural in Name This Bar near Taylor Square and in the titular stairwell for the launch of Stairwell Gallery at The Sugar Mill, again all alongside members of The Movement. You're involved with 'The Movement Collective'. What's that about? 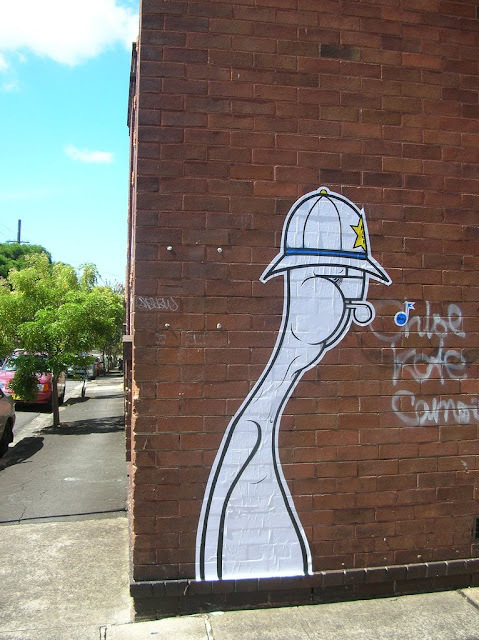 The Movement is the collective term loosely applied to the street artists of Sydney. We all help each other out, hooking people up with exhibitions, finding walls to paint, going out pasting together. It's all pretty relaxed and friendly and it just keeps getting bigger and bigger. 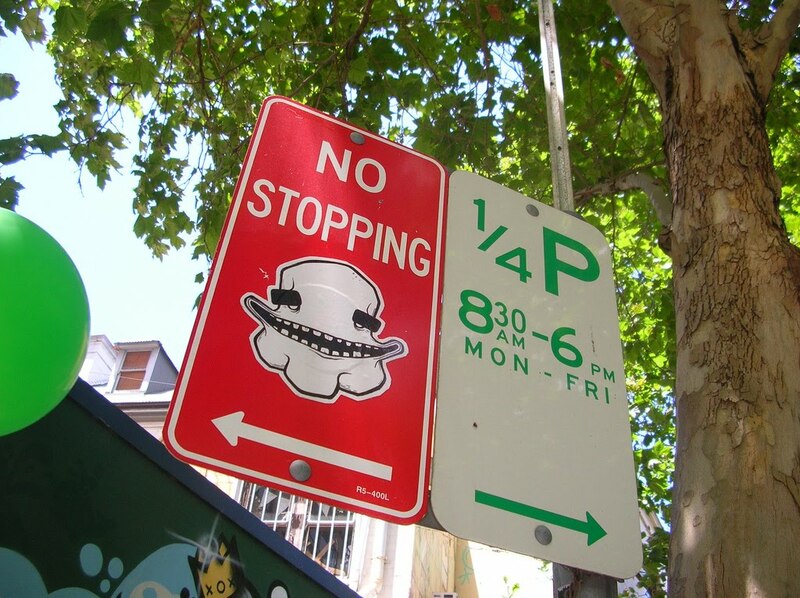 Keep an eye out for Movement Stax, new project pioneered by Movement Veteran SMC3, decorating a street near you, oh so soon. I like holding M&Ms in my hand til the colour stains my skin. It makes me feel like a chameleon. Catch Houl up against Max Berry at the semi-final of Secret Wars on July 1. More info here. ps. I know all his secrets... muwahahaha. Haha thanks for the comments. I'm sure Houl will enjoy this. M&Ms hands down. Skittles are no good.